Tis the season of negative advertising. 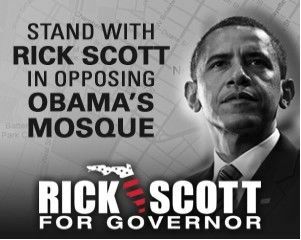 Rick Scott, a Republican running for governor of Florida, is posting ads asking you to stand up to fight Obama’s … mosque. Confused? We mean, just two years ago Obama belonged to a radical Christian church. No matter. It’s a classic depositioning move, casting a seed of doubt not meant to lure the logical but to sway only 5% or so of the population both (a) on the fence about whom to vote for and (b) angry about the idea of another religion building a house of worship in New York City. Negative ads work because they tap our deep-rooted, evolutionary fears. It’s the same impulse that makes you retreat from a spider or snake, potentially poisonous in the tropical lands of your ancestors, who were smart enough to flee and pass those fearful genes downward to you. We cringe before the strange, the foreign, the unknown that might hurt us. You can’t fight aversion. Fear is hard-wired to survival, because even if unjustified 99% of the time, the 1% that protects you from being bitten is enough for your DNA to survive. Expect to see more fearmongering this fall as politicians warn us of snakes and spiders all around. If only a few percentage points step back from suspicious half-truths, those who cast doubts win the game. Mr. Scott – the billionaire Medicare cheat, courted the Tea Party against his opponent, “career politician” Bill McColluum, and won the primary last night. He dismissed the charges against him – that he is a billionaire, documented Medicare cheat – as “negative attack ads” insisting that we “get to work,” all the while creating some of the most heinously misleading attack ads I’ve ever heard under a slew of patriotic-sounding PACs. He proved once again that if you throw enough money at TV and radio buys and hammer home a message with relentless frequency – that message will eventually stick. He goes up now against Alex Sink, who will be painted as a baby-killing, gay-loving, Obama worshiping Whore of Babylon – all while he smiles and pretends not to be involved in the negativity, touting his pro-life family, “let’s get to work” message.